Very sad. He died trying to protect his girlfriend from the rapists..
A man has died while trying to defend his 21-year-old girlfriend from being gang-raped by 6 men in Durban, South Africa. The heroic boyfriend, whose identify has not yet been disclosed, died at the scene and his girlfriend was taken to an undisclosed local hospital with severe injuries. 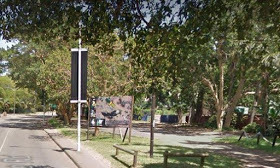 The incident unfolded when the woman and her boyfriend were walking near the Umgeni River Bird Park on last Friday evening. It is a popular walking and cycle trail. Her boyfriend did his best to defend his girlfriend from being attacked, but was assaulted and killed by the gang who had earlier got out of a Quantum minibus taxi. R24 spokesperson Werner Vermaak said the boyfriend was certified dead at the scene by paramedics. “The paramedics found the man with fatal injuries. There was nothing that they could do for him and he was declared dead. The woman was treated and taken to the hospital,” Vermaak said. Police were yesterday hot on the heels of the suspects and appealed to the public for any information they might have on the whereabouts of the minibus taxi to assist them in bringing the suspects to book. Police spokesperson Captain Nqobile Gwala said the police were still investigating and were hoping to make arrests soon. “The investigations are continuing. We are appealing to anyone who might have information about the suspects to contact the local police station,” she said. Transport, Community Safety and Liaison MEC Mxolisi Kaunda condemned the incident and urged police to work around the clock to bring the suspects to book before they continued their criminal activities elsewhere. "It was unfortunate that the incident happened after other incidents of abuse against women and children in the country, he said. He was concerned by the allegations that the suspects were travelling in a minibus taxi, a commonly used mode of public transport. “Following these allegations, we will be engaging with the leaders of the South African National Taxi Council in the province to discuss crimes that involve minibuses, and hopefully, find a solution so that such crimes do not escalate like in other provinces," he said. Kaunda urged the public to work with the police by reporting crime so that the perpetrators were caught.